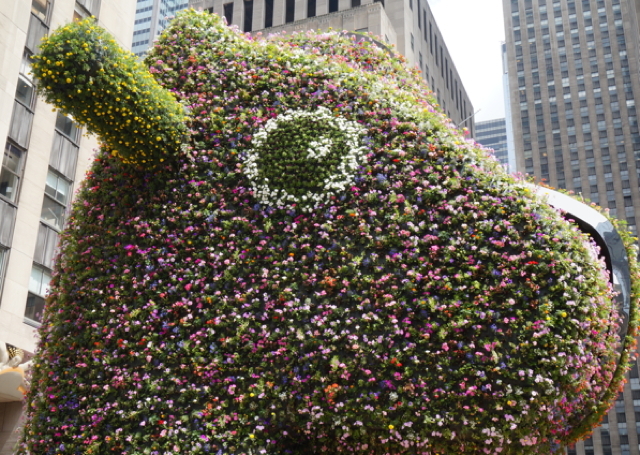 As if his museum-filling Whitney retrospective weren’t enough, Jeff Koons currently has a massive sculpture on view at Rockefeller Center. “Split-Rocker,” presented by Gagosian Gallery and organized by the Public Art Fund and real estate developer Tishman Speyer, is comprised of two halves, one the recreated head of a toy pony rocker that belonged to his son, the other the head of a toy dinosaur rocker. Each side is made out of steel and covered in flowering plants. They are brought together imperfectly, and where the edges of one don’t quite align with the edges of the other, you can peek inside to see the tubes of a sprinkler system. Gazing up at “Split-Rocker” on the day of its opening last week, I found myself thinking about Kara Walker. 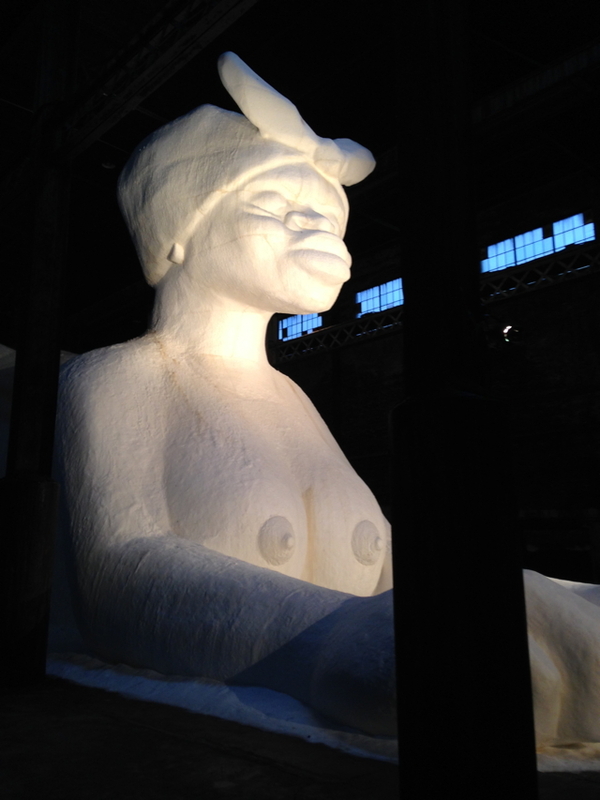 In the dark, dank space of the old Domino Sugar Factory on the Williamsburg waterfront — quite far, although not too far from the touristy crowds of Rockefeller Center — she has also installed a work of public art: “A Subtlety,” a gigantic sculpture of a mammy-as-sphinx made out of sugar, presented by Creative Time. And though Koons and Kara are about as far apart as two superstars of contemporary art can be, their current public installations have remarkable overlap. These likenesses may sound superficial. In a way, they are. But that two quite different artists have, when given the opportunity to make a public artwork, done something quite similar is worth exploring. There could be a very specific reason for this. When I read the first article to offer a glimpse of Walker’s Domino installation, in the New York Times, my reaction was that this piece seemed to be Walker’s take on big, boring public statues and on white guy art. By “white guy art,” I mean the big, bold, ‘shocking’ kind: Koons balloon dogs, Damien Hirst sharks in tanks, Paul McCarthy poops. It was brilliant, I thought, for Walker, a black female artist, to take the much-lauded, generally empty genre and one-up it, do it better. Now that I’ve seen “A Subtlety,” I still think that. Walker’s work at Domino is so much more engaging — so much more thoughtful, impactful, and meaningful — than Koons’s at Rockefeller, it’s almost laughable to compare them. Standing before “Split-Rocker,” once you’ve taken in the size and noted the plants, you become acutely aware of standing before nothing more than an oversized empty shell. Yes, the dissonance of the two mismatching forms makes for a nice, cockeyed contrast, especially with the flowers. But there’s a painful scarcity of content. Maybe you recognize the form of your son’s own rocker, or maybe your favorite flower is hidden among the 50,000, but all “Split-Rocker” has to offer are chance personal connections like these. And photo ops. Walker, on the other hand, has put almost too much content into her piece, so much so that the photo ops have become their own problem. 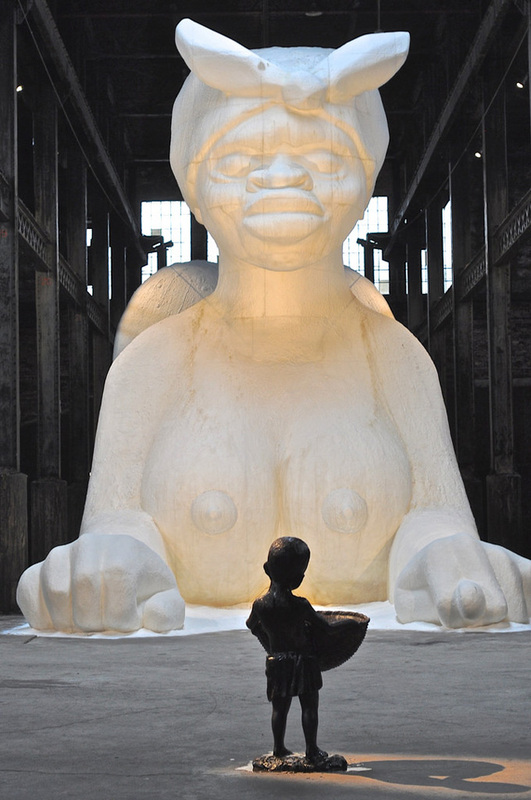 There’s the symbol of the sphinx, which conjures up ancient civilizations and mysteries; the positive and negative meanings of her fig hand gesture; her rendering in sugar, a material that harkens back to the slave trade; and her form as a mammy, which raises questions of the representation of black women. “A Subtlety” may be massive, but it can barely contain all of these ideas — they are swirling around and oozing out of it. (Not to mention the added dimensions of the 13 blackamoor sculptures that are made from molasses and scattered, now melting, throughout the space.) “Kara Walker has trenchantly used Koonsians [sic] tactics for very un-Koonsian ends,” Andrew Russeth recently wrote in Gallerist. And in doing so, she’s made Koons look exceptionally foolish. Why pour a well of resources into a sculpture that is its own end game when that same sculpture could be a beginning? This extends to the way Koons and Walker approach their subjects: Koons began with a personal object (as many of us do), added a neat formal twist … and then stopped. 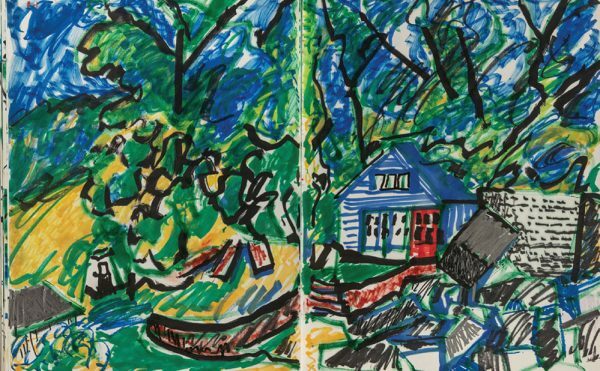 Walker’s art has long sprung from her identity as a black woman, but she focuses on a place where private narratives overlap with public histories. “A Subtlety” is no exception. Koons’s failure to take this leap speaks to his white male privilege, or his lack of imagination as an artist, or both. Nonetheless, “A Subtlety” isn’t perfect public art either. As my colleague Hrag Vartanian noted in his review, Walker still relies on the sphinx’s scale to deliver much of its punch. The figure is loaded with symbolic associations, but they impose more than they ask — an extremely problematic position for a sculpture that replicates racist imagery. 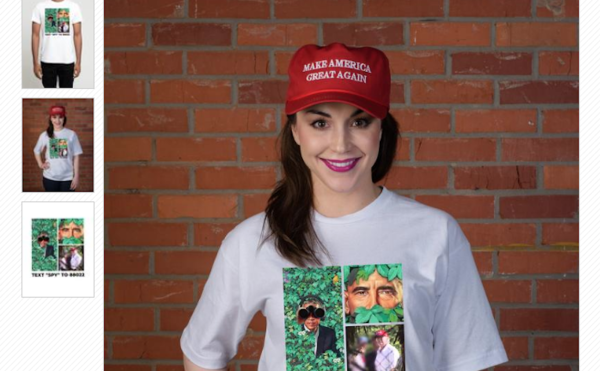 This silence, combined with the lack of context provided at the site by the artist or Creative Time, have created a situation where people — particularly white people — feel free to pose offensively with the woman-as-sphinx, thereby reproducing racist power dynamics. In the wake of that, it’s been left to independent groups to organize actions around “A Subtlety”: people of color gathered for “We Are Here” on June 22 and the Free University of NYC has planned a teach-in for this Saturday. The exchange between Walker’s sphinx and its public is one-sided. And that’s because, hard as Kara Walker may have tried to subvert the trope of big, static, public sculpture with shocking imagery, unusual materials, and an artwork that decays over time, she has still, at the end of the day, made a big, static, public sculpture. 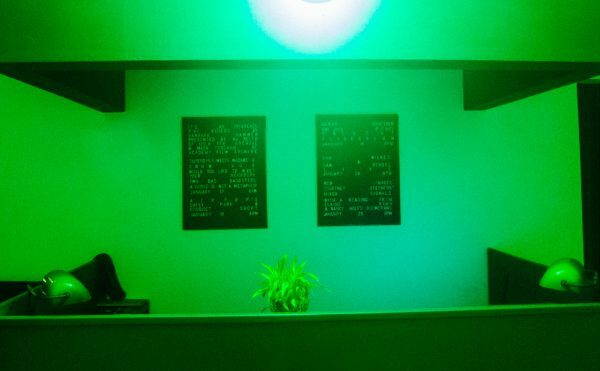 During a conversation with RadioLab’s Jad Abumrad at the New York Public Library in May, Walker discussed some of the ideas she’d had before arriving at the sphinx. In the time since, I’ve found myself returning over and over to one: filling the space with a bunch of women dressed as mammies roller-skating around with brooms. Walker dismissed it as absurd, and I certainly see her point — but I can’t stop thinking about how dynamic it sounds. There are so many ways to make art and so many ways to engage the public; why settle for the most obvious one? Kara Walker’s “A Subtlety” is on view at the Domino Sugar Factory (South 1st Street at Kent Ave, Williamsburg, Brooklyn) through July 6. 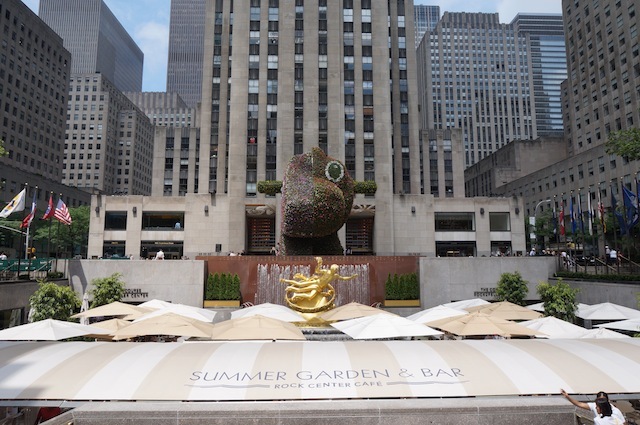 Jeff Koons’s “Split-Rocker” is on view at Rockefeller Center Plaza (Midtown, Manhattan) through September 12.